Protect your valuable investment with Jeep Wrangler wheel locks that also fit the Jeep Liberty. 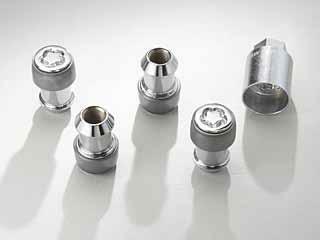 Each of these Jeep wheel locks comes in a kit that includes five chrome-plated locking nuts; they feature nickel and zinc-plated tumblers. Each set has one Mopar key for security purposes. These wheel lock kits help keep your Jeep safe from wheel and tire theft without compromising your wheel balance or the functionality of your tires. One-piece wheel lock kit, set includes five locking nuts, one exclusive Mopar key (5th wheel lock is for exterior mounted spares). Locks have been re-designed to be more secure than previous versions. Dealer wanted a lot more to put these wheel locks on when I bought my Jeep. Same as dealer sells in Mopar packaging. I am impressed with the product you supply. One draw back for me is the way they seem to not blend in with stock lugs. other ones. But other then that they function above my expectations. ProsThey perform exactly as anticipated. ConsJust draw attention to the difference in the contrast to the original lugs. Very nice set. Currently St Louis is having a string of tire thefts and it feels good to have the extra protection. When in the drive way or parking lot while hiking the trails, I feel safe knowing my tires will be there when I get back. ProsComes with 5th lock for spare tire. They're made for the Wrangler, as you get five locks and a key. They fit perfect and look great! Attempt to keep one's tires safe. What's to say they go on like lug nuts but with a dedicated device. ConsDidn't see any comments about the quality of steel and the inability of a thief to break them off with a cold chisel! The old standard still works well.